The Dynolite Classic range of oils is formulated for engines produced from the early fifties to the mid-eighties that use micro particle oil filters. The multigrade formulation reduces engine wear and the load on the starter motor when cold cranking. However, they remain thick when hot, when compared with monograde oils (SAE30/40/50) - this prevents low hot oil pressure and resulting engine damage. Monograde oils thin when hot, reducing their effectiveness. Dynolite Classic 20w60 is a light grade and high viscosity multigrade engine oil replacing SAE30 grade. This oil is ideal for engines were a 20w50 was originally specified, as it provides better oil pressure when the engine is hot for prolonged periods. Suitable for many post-war engines, in particular high-performance vehicles such as Triumph, MG, Porsche, Jaguar, Ferrari, Alfa Romeo, etc. This oil is also recommended for cars using a 6 volt electrical system, where the starter motor requires minimum resistance. For Classic engines 1950-1985. 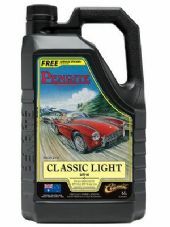 High quality 20w-60 multigrade engine oil for popular classic cars. Contains optimised levels of ZDDP for wear resistance. Contains Calcium Sulphonate. May produce an allergic reaction. Avoid contact with skin or eyes. Wear protective clothing. Dispose of waste product and container correctly.